Cressingham Gardens estate in south London was built between 1967 and 1979 to the designs of Lambeth Borough Architects, led by Edward Hollamby. It is impressive for the quality of the accommodation and layout, and for its striking landscape setting. 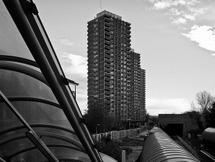 The estate is currently under threat from proposals by Lambeth Council to demolish and redevelop the site. The homes on the estate provide accommodation for households of one to six people, ranging from one bedroom bungalows to four-storey houses, each with its own private outdoor space. They are built from London stock brick in two main building configurations. Type A, the larger of the two, combines four-person houses on one side of a central pedestrian way and two-person flats and five-person maisonettes on the other, all above communal garages. Type B also has a central pedestrian way, with six person houses on one side and two tiers of two-person flats on the other. They are set along a series of paved pedestrian walkways and paths that meet at a central ‘village green’. The design of the estate is deliberately simple, and it is built of good quality materials. An important element in its success is its thoughtful integration into the setting of neighbouring Brockwell Park. It was kept low-rise to avoid obstructing the views from the park and to enhance the sense of contact with open space for residents. The central village green extends the landscape of the park into the site, and buildings are arranged so that the lower ones are around this plateau, rising to four-storey blocks around the perimeter. The estate was planned to retain as many existing trees as possible, and a tongue of landscaping extends from the north of the plateau to Tulse Hill, giving views into the site to passers-by and providing a pedestrian route connecting to the nursery school and then on to Brockwell Park. Cars are kept at the perimeter of the site, with paved access to the housing. Edward Hollamby acquired a reputation as a public servant who “believed not just in high quality architecture, but in the existence and nurturing of the public realm, of public architecture and civic design” to quote his obituary in the Guardian – qualities that are evident in the design of Cressingham Gardens. He joined Lambeth as borough architect and town planning officer in 1963, rising to director of architecture, planning and development, and was influential in the move away from high rise tower blocks towards low-rise patio developments. 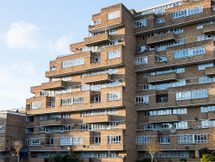 Under his helm, Lambeth became known for its sensitively-designed high density, low-rise housing – a highly relevant model for today’s housing crisis.